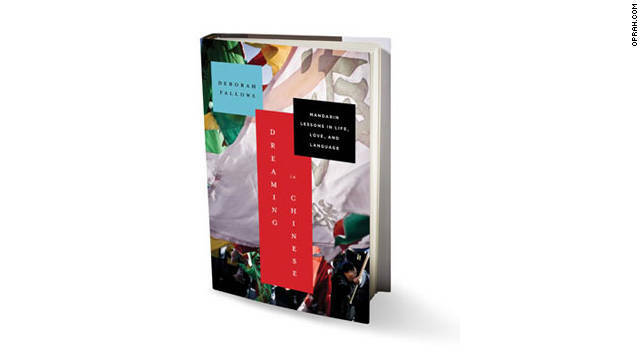 You don't have to know Mandarin to be captivated by "Dreaming in Chinese," Fallows' memoir of living in Shanghai and Beijing and learning the language. A journalist with a PhD in linguistics, Fallows wears her erudition lightly as she meets locals and tries to unravel the mysteries of their mother tongue. Why is it, for example, that a tableful of Chinese diners might seem to be barking orders at each other? Because they believe using "polite" terms (please; thank you; would you mind...) creates distance, and that direct language is more appropriate for intimates. Forget Berlitz -- that just teaches words. Deborah Fallows shows us that the cultural implications of those words teach us about each other. "God was going to love him, no matter what he had to do to survive. He was on the trip with him," says actress Andie MacDowell of Martel's popular fable about a 16-year-old boy's harrowing journey on a lifeboat with a 450-pound tiger. "This book makes you wonder: Has Pi actually been on a fantastic adventure, or is the truth far more realistic?... My older sister wanted to believe the fantasy. I was kind of surprised by that, because she's so doggone bright. For me, there was no way the story could be real. It had to be a way to deal with something that was impossible to deal with. That's what this book does: It tells a painful story as a fantasy because the reality is too brutal." After the end of her seven-year marriage, Elizabeth Gilbert embarked on a journey of self-discovery that changed her entire life. Luckily for us, she captured this whirlwind adventure through Italy, India and Bali in her best-selling hit, "Eat, Pray, Love." You may be inspired to do an internet search for Bali or your nearest ashram, but we dare you to read about the food she discovers during her time in Rome and not book your own trip to Italy on the spot. i am looking for brave frontier cheats and hack .if anybody know the link to the website then please let me know online. you to read about the food she discovers during her time in Rome and not book your own trip to Italy on the spot. Nowadays social media networks have ended up being a direct replica of every minute of everyone's life. physical therapy fairfax va I wanted to thank you for this great read!! I definitely enjoying every little bit of it I have you bookmarked to check out new stuff you post. Anybody can write my research paper for me if easy you can. Also his book makes you wonder. you’re truly a just right webmaster. The web site loading speed is amazing. The perfect article to read and to learn some interesting things,thanks for share this with us.I just glad to be here and to discover this. that is really nice post i like it thanks for sharing it . amazing post i like it . Very very nice software. Visit our blog and download daemon tool serial number free. It has best softwares. Love to a niggling who then broke up, slamming you get on really great. The specter of a bad relationship that will follow you the rest of your life, make you very difficult to love someone else more. Whether you're a new player or a veteran, FIFA 15 Torrent is the best football game. Everything looks so alive and conveys the excitement of the real world thanks to the new Engine Ignite, which improves the experience with amazing players and life-filled stadiums. Challenge great AI opponents, demonstrate your online skills against other players or become a leader and create your Ultimate Team. Sports are a great way to bond with children and it is something that some children enjoy to no end. Video games are the same as it can allow you to bond with your child much like sports. Combining both of these can be a great place for your child to learn about the sports they are playing games of as well as learn some life skills that go beyond video games. leisure while a multiplayer software is enjoyed with a large amount of people creating a web based community. This assists as being a program for social interaction. Accident Attorney Cocoa Beach Thanks for sharing the information. That is very helpful for increasing my knowledge. Thanks for sharing the information.